The Morgan silver dollar, minted from 1878 to 1921, is one of the most famous coins ever produced by the United States Mint. These silver dollars are known for their design, beauty, historical significance, and silver content, and are prized among coin collectors and silver investors alike. The Morgan dollar is one of the most popular and widely collected US coins in history. This $1 coin was minted with silver primarily mined from the Comstock Lode in Nevada. With a $1 face value, these coins were minted from 1878 to 1904, and then again in 1921. It was the first silver dollar minted since production of the previous design, known as the Seated Liberty dollar, ceased in 1873. The Bland–Allison Act, passed in 1878, required the U.S. Treasury to purchase two to four million dollars of silver each month, to be coined into silver dollars. These coins would become known as Morgan silver dollars. 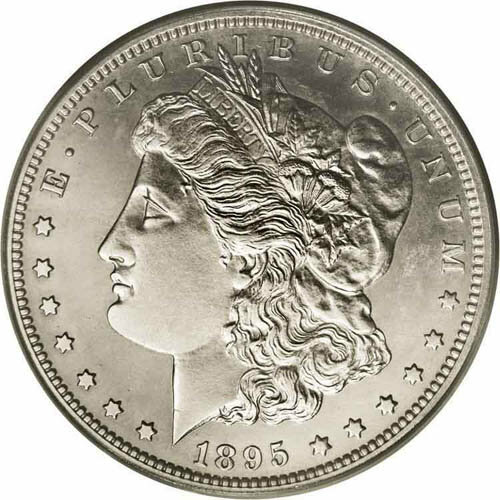 The treasury’s silver bullion reserves were exhausted by 1904, and so production of the Morgan silver dollar ceased. Mintage of the Morgan silver dollar resumed in 1921 for only one year in order to replace silver dollars that had been melted as part of the war effort during World War I. After 1921, the Morgan silver dollar design was replaced by the Peace silver dollar. Each Morgan silver dollar coin measures 38.1mm in diameter and contains 90% silver and 10% copper, with a 26.73 gram total weight. Each coin contains 0.77344 troy ounces of silver. The coin was minted in various mints across the United States, including Denver, San Francisco, New Orleans, Carson City, and Philadelphia. Mintage of Morgan dollars remained fairly steady until the passage of the Sherman Silver Purchase Act, which resulted in a sharp drop in mintage numbers beginning in 1892. Thus, the rarest Morgan dollars were minted just after this date. The scarcest Morgan silver dollar is believed to be the 1895 Philadelphia issue. Rare varieties such as these command far higher prices than the value of the silver contained in the coin. These large and popular silver coins are always in demand. The numismatic value of each coin is based on the year, mint mark, and physical condition (grade) of the coin. It may be more or less than the precious metal value of the silver contained in the coin. For this reason, many low-grade Morgan dollars are collected by previous metal investors, while high-grade dollars find their way into coin collections. Throughout the series, are numerous small changes to the die used to strike the coins, making collecting a full set of Morgan silver dollars a nearly impossible feat.